Which Star Wars character was gender-swapped, which was almost a monkey, and how George Lucas made the most expensive bet of his life. Of the many, many problems (and one of little-known Star Wars facts) with this clunky script that would eventually become Star Wars: A New Hope, one that seemed easily fixed to Lucas was the serious lack of female characters. So, Lucas did something radical: rewrote his story’s main character, Luke Starkiller, as an 18-year-old girl. 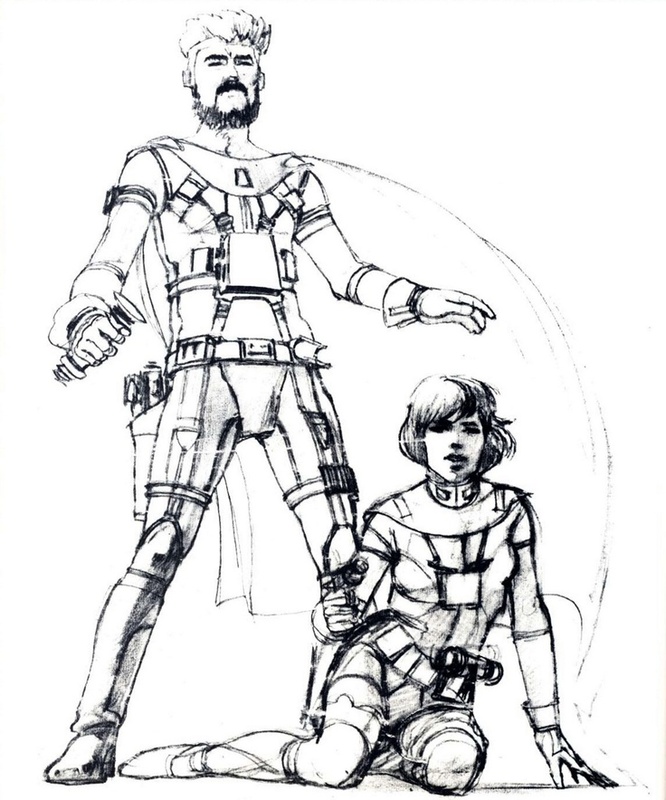 At least one concept drawing by artist Ralph McQuarrie exists of this short-lived gender swap, but a few months later, with Lucas’ next draft, Starkiller was a boy again. Star Wars wouldn’t get a female lead until nearly forty years later. If you’re a Star Wars fan and a Disney fan, you have to check out these Disney attractions. Next time you complain about the goofy CG Yoda from the prequels, consider one of these Star Wars facts: the spiritual center of the Jedi order was almost a real-life monkey in a green mask carrying a cane. Luckily, there was a monkey expert on set to throw a banana peel in this plan’s tracks. One of the crew who worked with apes in 2001: A Space Odyssey quickly pointed out, “Look, the monkey’s just going to pull off the mask over and over again. It’s never going to work.” The team soon enlisted Muppet master-crafter Jim Henson, who suggested casting Frank Oz (formerly the voice of Miss Piggy) to bring Yoda to life. Love Yoda’s quotes? These are our favorite Star Wars quotes of all time. The original ending of Return of The Jedi has Luke assuming Darth Vader’s role as evil Galactic enforcer, and Han Solo dying in his heroic raid on the Death Star. Harrison Ford probably would have been fine with this. Ford was famously snippy about Lucas’ script (“George, you can type this ****, but you can’t say it.”) and in a 2010 interview he waved off his iconic character as “Ham Yoyo,” stating he was officially “done with him.” Time makes fools of us all. Well, in a manner of speaking. When Emperor Palpatine first appears as a hologram in The Empire Strikes Back, the person under the black mantle and facial prosthetics is not Ian McDiarmid, who played Palpatine on screen in Return of The Jedi. It’s not a man at all: the first Emperor we see is actually Elaine Baker, then-wife of Star Wars makeup designer Rick Baker. As Gizmodo points out, Rick Baker once donned the monkey suit in the 1976 King Kong remake, so we can technically say that Emperor Palpatine and King Kong were legally wed. (Just try not to imagine their children.) Celebrate your Star Wars love with these hilarious corny Star Wars jokes. The famous floating text that opens A New Hope may have been one of the greatest special effects achievements in the film. As Mental Floss points out, the text was filmed practically “by carefully placing 2-foot-wide die cut yellow letters over a 6-foot-long black paper background with a camera making a slow pass over them to mimic the crawl.” What’s now a default option on filmmaking software took LucasArts three hours to capture. Bonus Star Wars fact: That “revolutionary” text effect? Flash Gordon did it first. Apparently, the smell was so bad that Mark Hamill burst a blood vessel from trying to hold his breath, and the camera angle had to be adjusted for the rest of the scene so as not to show his injury. As for Peter Mayhew’s yak-hair Chewbacca suit? It reeked for the rest of production. Bonus Star Wars fact: At the start of A New Hope, Chewbacca is 200 years old. How do you capture a presence as big as Darth Vader? Cast four men. The on-screen body of Vader is six-foot-five bodybuilder David Prowse; his stunt double for action scenes is professional fencer Bob Anderson; the voice of Vader is the great James Earl Jones; and the de-helmeted face of Vader in Return of The Jedi is Sebastian Shaw. Love movie trivia? See if you know the answers to these questions everyone gets wrong. Get a load of one of these Star Wars facts: Lucas kept the twist ending of Empire so well guarded, he even wrote fake text in the script to throw the actors off. During filming, David Prowse (whose voice was later dubbed by James Earl Jones reciting the actual line) yelled to Mark Hamill: “Obi-Wan killed your father!” The cast and crew thought this was the real line—only Hamill, who had been told the truth about Vader moments before filming the scene, knew otherwise. If the secret leaked, it would all come back to Luke. Named by some as the most expensive puppet in the world, the $500,000 Jabba the Hutt model required seven people to bring to life: “Three puppeteers were inside: one controlled the right arm and jaw, another handled the left hand and jaw, tongue, and head movements, and both of them moved the body; a third person was in the tail. Outside, there were one or two people on radio controllers for the eyes, someone under the stage to blow cigar smoke up a tube, and another working bellows for the lungs.” Here are some more facts about the most expensive movie props and memorabilia out there. 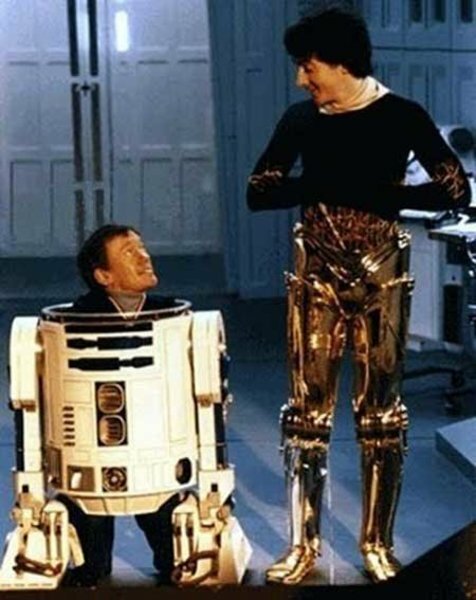 In less expensive news (but another one of these rare Star Wars facts), Kenny Baker, the man destined to live inside R2D2, also donned the bear suit to play an Ewok in Return of The Jedi. He plays Paploo—the enterprising Ewok who steals an imperial speeder bike. Bonus Star Wars fact: The word “Ewok” is never mentioned once in the original trilogy (though they do get a credit at the end.) Plus, you’ll never guess what Return of the Jedi‘s original working title was. Bonus Star Wars fact: In other surprising composition news, the new Cantina music featured in The Force Awakens was written by Lin-Manuel Miranda—the creator and original star of current Broadway smash hit Hamilton. Kids should thank sound designer Ben Burtt for some of the most memorable noises of their childhood. Want to know how he did it? The sound of Darth Vader’s breathing was recorded by putting a microphone inside a scuba tank regulator; Chewbacca’s signature Wookie gargle is a combination of bear, walrus, lion, and badger sounds. The sound of Vader’s pod door closing in Empire is reportedly the sound of a whole block of Alcatraz cell doors slamming shut. The kicker? Lucas actually made good on his bet. (Doesn’t hurt when you’re a billionaire.) Next, check out these Star Wars facts everyone gets wrong. And may the Force be with you.